Tuesday 4th July - Hindeloopen to Harlingen 20 nm, no wind, no sailing. Pretty as Friesland is, we are keen to get out into the Waddenzee while this lovely weather lasts so we push off from Hindeloopen and head north again. We're not going to stay in Makkum but we are curious all the same and have plenty of time so we call in. We tie up by the lock to the old town and the Harbour Master lets us leave Bonify there for an hour while we have a wander round and buy bread. Makkum is another pretty town but if I put any more cute pictures of Dutch houses and canals in this blog I may start to lose readers so I'm giving you a break from that. I might have posted a picture of one of my favourite old gaffers Vlieter which is moored here but I was at the helm when we spotted her on the way out. Howard was tidying up the warps and managed to knock over our jug of coffee in the cockpit at that very moment so the opportunity was missed. Sorry not to see you Kees and Hammy, but the Waddenzee is calling us. 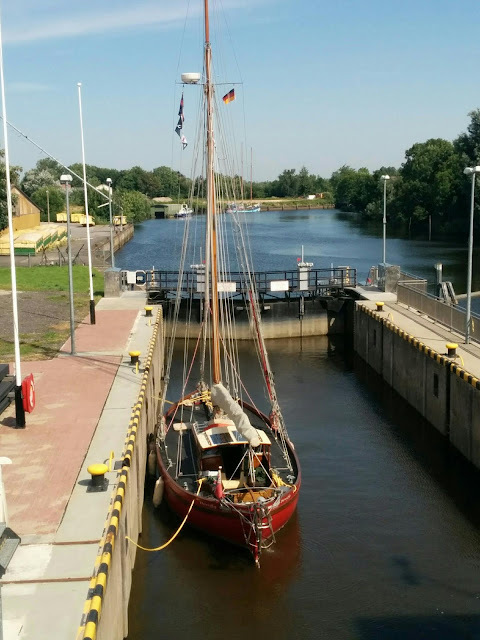 By lunchtime we have passed through the Kornwerderzand lock from the freshwater of the Ijsselmeer into the Waddenzee. A photograph of the Waddenzee in these conditions would be just pale blue from top to bottom with perhaps a fine line of horizon and a few ripples in the bottom half - beautiful and serene as it is I took pictures of boats. Now what do we do....? 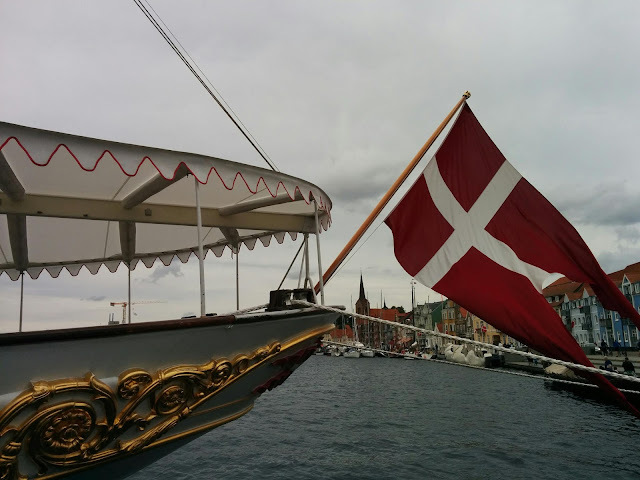 We want to have a look at the port of Harlingen before we head out to the Wadden islands so we motor slowly along the coast in a shallow channel, pass all the ferries and the commercial vessels in the outer harbour and tie up in a sailing club berth. You'll see from the next photo that we met friends here too. 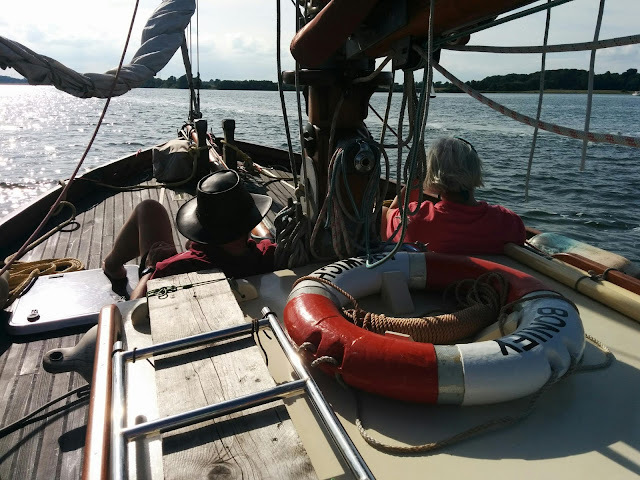 Marc and Carola are here on their big steel gaffer Eva Kristina but by the time I write this (4 days later, bit of a delay on the blog, sorry) a search on the Marine Traffic website shows them approaching the coast of Norway. They've been away for many months in sunny climes but still have some time before they go back to work so they are hiding here briefly before setting off again. You would look tanned and happy and relaxed if you'd just spent a whole year cruising in the sunshine - not sure what Howard's excuse is. 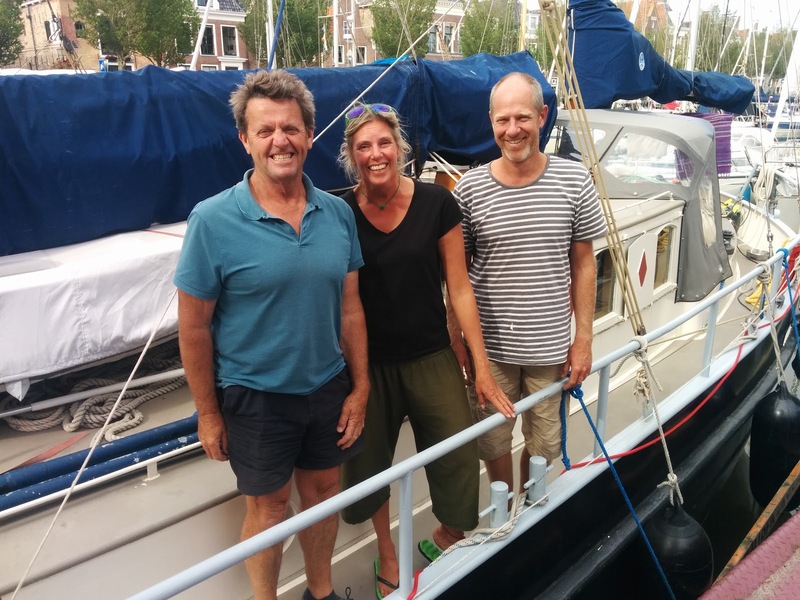 We leave Marc and Carola to finish their preparations to depart, which include sail repairs and a vet's appointment for the dog, and we wander round Harlingen. I will keep to my resolution and spare you yet more cute urban canal scenes. 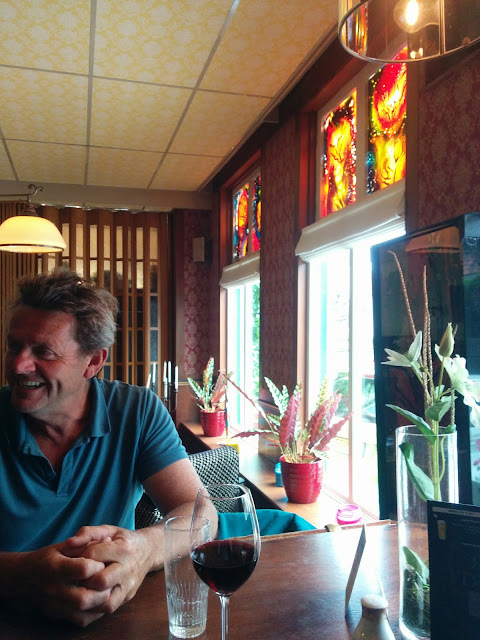 We've decided to treat ourselves to a meal out (our last restaurant meal not counting Finland was in Middelburg) so we must choose carefully and we do some lengthy research. We chose well - found a hotel on a side canal with tall pink hollyhocks outside and large old fashioned dining room inside with a 3 course tourist menu at under 20 euros. Perfect, we recommend.